TIBÁS — It’s difficult to enjoy a spectacular sunset while the concrete grandstand of a 50-year-old stadium shakes haphazardly under your seat. 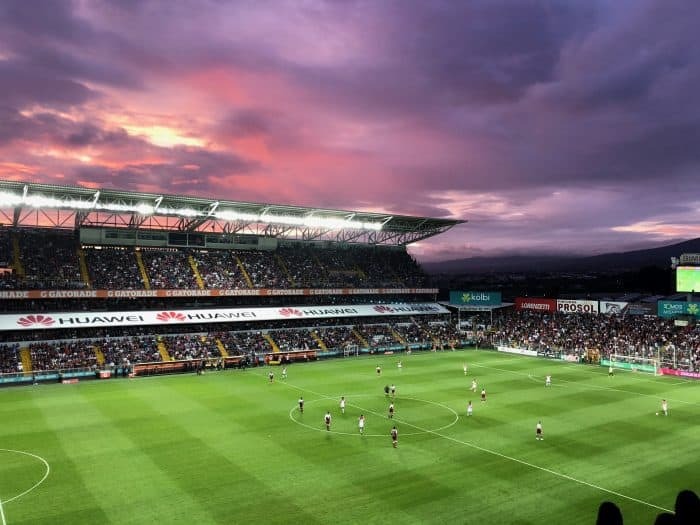 I learned that lesson Sunday evening in the upper level of the Ricardo Saprissa Aymá Stadium while watching a bitter soccer rivalry, hearing a few things about the referee’s mother and wondering if trading a camera for a stranger’s cédula had been a fair exchange. More on that last bit later. 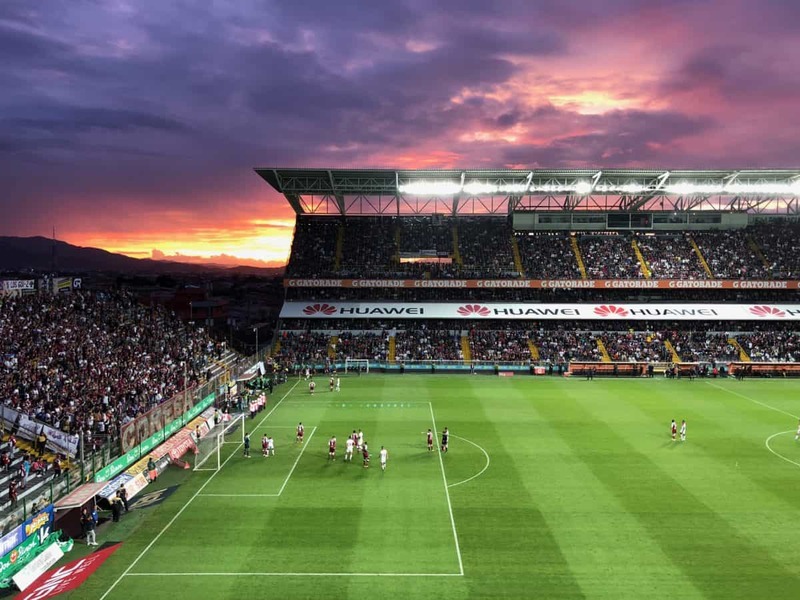 El Clásico, the nickname for the heated clash between Saprissa and the Liga Deportiva Alajuelense, lived up to its reputation. The home team, Saprissa, delighted a packed Cueva del Monstruo with a 2-1 win, pulling them to within a point of their arch-nemesis in the leaderboard. But if you’ve been to a Costa Rican Clásico, you probably know the event is about more than just soccer. Here are five things I learned. Admittedly, this is mainly an excuse for me to share these photos of Sunday’s wonderful sunset over the Central Valley. 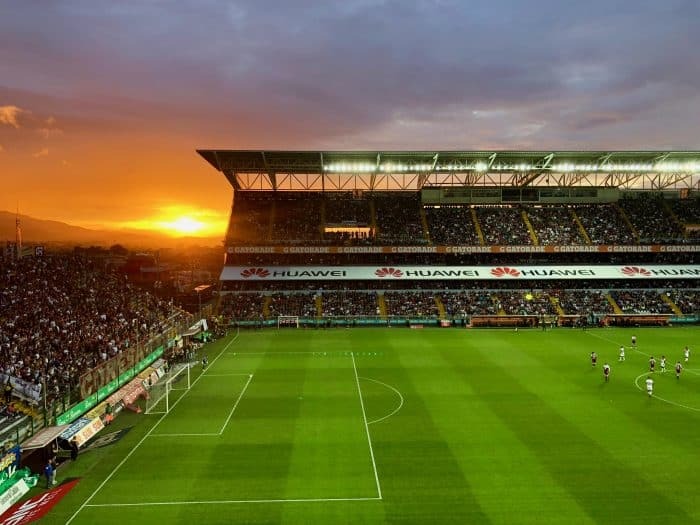 Sitting on the east side of Estadio Ricardo Saprissa means you may spend the 90-minute game battling the sun’s glare. But during the cloudier rainy season and with early sunsets, that may be a risk worth taking. I wasn’t the only one averting my eyes from the on-field action for a moment to snap a postcard-worthy shot of the orange-and-purple-tinted skies. Even if the game had been boring — and it wasn’t — the view alone was worth the price of admission. Costa Rica has been no stranger to violent hooliganism from its barras of superfans and others who care a little too much about someone’s sporting allegiance. A strong police presence in Tibás throughout the day — both inside and outside the stadium — helped mitigate physical altercations. Riot police gently escorted at least one overly passionate fan from the Ultra Morada section in a full arm-bar, but that group is kept segregated from the rest of the stadium. My section had a mix of Saprissa and Liga Deportiva Alajuelense supporters, and there was plenty of intermixing in the crowded concourses and on the streets. Aside from an abundance of swearing and a few middle fingers, it was a relatively tranquil affair. That term confused me. As a professional, isn’t any camera I own technically a “professional camera?” My colleague and I thought our logic was sound, so we took a chance and brought a small DSLR. That was a mistake: The security team at our gate saw the camera and turned us away. We wouldn’t be let in with the device. Thankfully, the security supervisor took pity. She spent the next 20 minutes leading us around the stadium — first to a storage room, then to the team store, then to a food stand — asking unsuccessfully if we could leave the camera there. Finally, she spoke to a coworker, who had a car parked nearby and was willing to let us use it for storage. To alleviate our concerns that her coworker would disappear with the camera, she gave us his cédula and told us where to locate them later. And, true to her word, we found them waiting for us after the game. I won’t name either of the workers, in case their behavior went against stadium policy. But I’ve rarely seen event staff go so far out of their way to accommodate fans, and that altruism deserves commendation. A team’s most valuable player isn’t always the one who can create magic with the ball at his feet. Sometimes it’s the person who seems to have spent hours training not on the pitch but at the world’s finest acting school. He exaggerates contact — or makes it up entirely — and rolls on the ground, writhing with an imaginary pain that magically disappears when the requisite amount of time has bled off the clock. Sometimes it’s the person who must have been an oldest sibling, because he knows how to grab and pinch and pull the opponent when the referee isn’t looking, frustrating his target just enough to force a rule-breaking retaliation. Sometimes it’s the person who isn’t even on the field but in the bleachers. She hides the ball that a player launched into the stands with an errant shot, and when the opponents start their attack, she launches it back onto the pitch — stopping the game to her team’s benefit. Costa Rican soccer is not always the “beautiful game,” as the Brazilian legend Pelé might envision it. But it is a spectacle — and an entertaining one — nonetheless. When the whole stadium starts chanting and the grandstands tremble, you can either wonder whether architects in the 1970s knew about mechanical resonance, or you can join in the singing. And when the sun starts to set, pull out your non-professional camera, or take a really good mental picture. And enjoy the show.